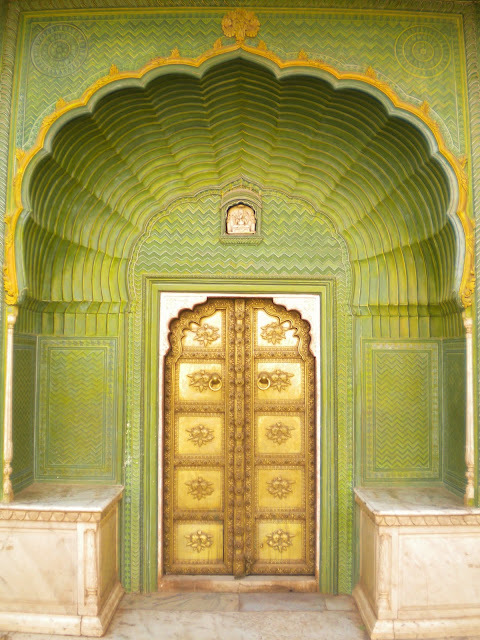 Gateway, located in one of the courtyards of the Jaipur city Palace. It's called the Green Gate, and is meant to represent the season of Spring. The courtyard contains three other gates, each of them symbolizing a separate season. If you've ever seen the movie "The Fall," the Indian character is introduced in front of this door. Hi folks. So, it's been a while...would have posted sooner but I've been having terrible internet luck. I'm going to divide this up into two parts....hopefully I'll be able to get the second half of the post done before I head out to Uttarkashi, but no promises. As Clausewitz said: No campaign plan survives contact with India. As of now, I've finished up studying Hindi, at least for the time being. There's still so much more to learn, but right now I just don't have the money. Actually, speaking of money, my funds are looking pretty damn scanty at the moment. I'm pretty sure I'm going to be able to make it through the trip, but I'll be just barely squeezing by. But on Tuesday I'm leaving Landour, and heading to the city of Uttarkashi to attend a Basic Course at the Nehru Institute of Mountianeering. I'll have to negotiate my way there via buses and crowded 4-wheel drive vehicles, which should be a brightly colored adventure in and of itself. Though I am looking forward to it: since my funds are so low right now, I had to cancel my last week of Hindi, so for the past few days I've not had much to do. I'm longing for giant rocks and glaciers. Anyway, in the last post I think I explained that I missed my train to Jhodpur....there was some agitation involving the Jats (as an aside, Jats seem to be Persian in origin, there are Hindu, Muslim, and Sikh Jat communities, and the Indian freedom fighter Bhagat Sing and also the Bollywood movie star Bobby Deol, are Jats). They were striking to gain some sort of affirmative action. My train was cancelled as, at least according to the guy behind the counter at Hotel "The Spot", the tracks were covered with Jats. So, that completely threw off my plans, and I wound up only going to one city, Jaipur, and spending much more time in Delhi than I had originally intended....though, still, the trip was far from a total waste. The grisly fate of many a woman tourist in Pahar Ganj. As always, I spent a while in Pahar Ganj, and the place was just as timelessly touristy and trippy and F***ed up as ever...tried to take a few pictures that would capture the spirit of the place, but I fear, in the end, one has to actually observe firsthand the clumsy multicultural interactions of crusty soul-searchers and Delhi penny-pinchers to truly catch the sleazy Pahar Ganj vibe. 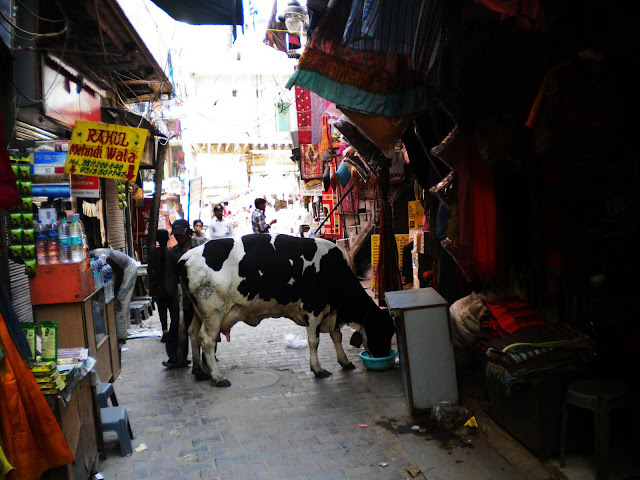 A cow next to the Mendiwala, Pahar Ganj. The man in the stall next to Smt. cow was very incensed that the cow was drinking the water in that blue container (don't ask me why). He ran out and kicked Smt. cow a couple of times, but she didn't budge, and finally the man gave up and let the cow go about its business....a typical Pahar Ganj scene. The only new thing I did in Delhi before leaving to Jaipiur (via bus), was to go to the National Museum. 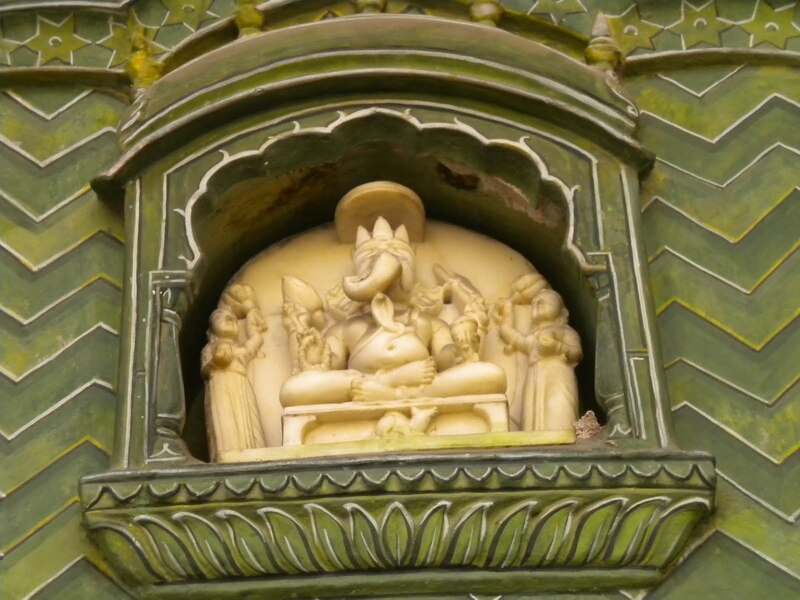 As a friend of mine had said, parts of it can get a little tedious (you do wind up seeing practically the exact same carving over and over and over again: Krishna and his consort Radha, Radha and Krisha, Krisha and his consort, Krishna and Radha). I think that most of the carvings come from ruined temples, where they would have been incorporated into the architecture, rather than just standing alone, and as such would seem less repetitive. That being said, there's still lots of really impressive stuff in their collection, including a couple of pieces that I've been seeing pictures of ever since I got interested in things Indian. In particular, whenever you read anything about the Indus River Civilization (the earliest known civilization in this part of the world), you almost always see a picture of this figurine, the famous Harappan Dancing girl from Mohenjo-Daru. Well, at the National museum they actually have it, in a separate exhibit about the Harppan Civilization, along with all these fairly odd, much more primitive looking terracotta figurines, some of which actually look like they were made by little kids. The difference in skill from piece to piece is quite pronounced. I think you wind up seeing the Dancing Girl piece everywhere because it's so much competent a piece of sculpture than most of the stuff they have on the display. Also, in the Harrapan exhibit you can see examples of the mysterious, as yet undeciphered Harappan writing system, which really doesn't seem to be related to anything else out there. It consists of a series of pictographs, but it doesn't seem to have more than a couple of dozen symbols, and the inscriptions themselves are never more than ten or so pictures long. It's odd. But I finally made it out the Jaipur the next day. Just wound up taking a bus...I just had to accept the fact that all the money I had spent on train tickets was lost. 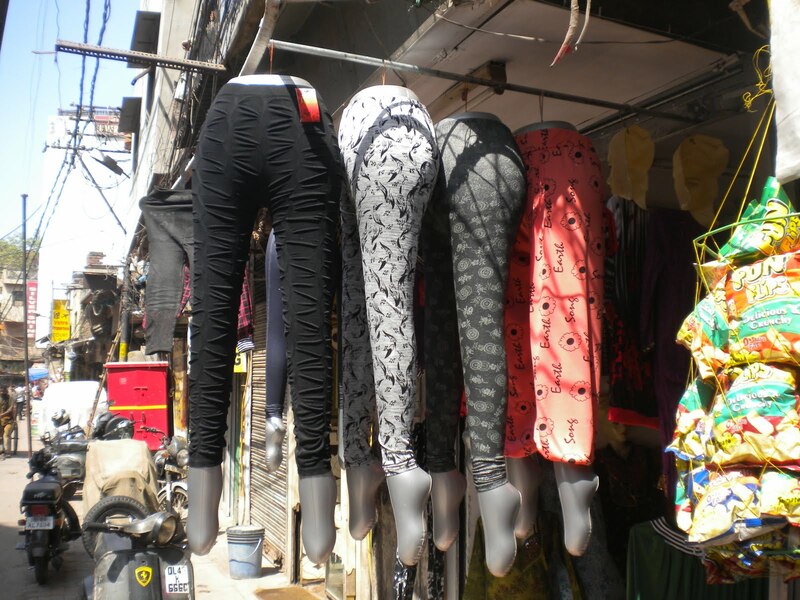 My time in Jaipur began on a weird note. 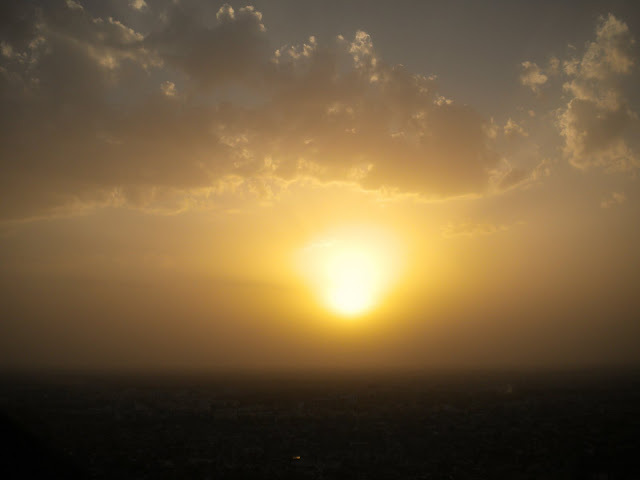 Instead of dropping people off in Jaipur itself, the bus dropped us in Amber, the former seat of the rulers of Jaipur, and about 15 kilometers from Jaipur, and we had to make our own way into the city. I wound up in the rickshaw of a certain Mithun, who, upon getting me into his vehicle, proceeded in show me his "bible" as he called it, which was a whole notebook full of glowing reviews of Mithun's services written by foreigners. I wasn't quite sure what to make of it, frankly, for as he took me into the city center it became rapidly apparent that A: he was grievously overcharging me and, B: he was part of huge family of Jaipur Rickshaw riders...in fact, for reasons that were never really made clear, I wound up being made to switch rickshaws midway through my getting to Jaipur Odyssey, into Mithun's brother's vehicle. The brother claimed to have married an American woman...though they apparently got divorced after three days. Where I stayed was this place called Hotel Kailash. 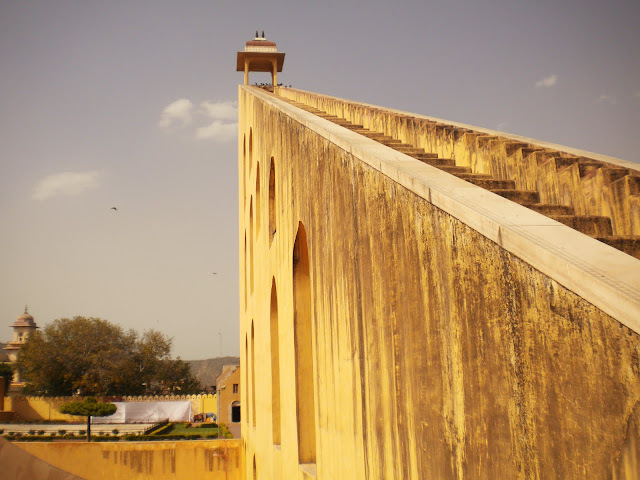 It's literally right in the middle of the Old City, in fact within viewing distance of the most famous landmark in Jaipur, the rather strange Hawa Mahal. But hotel Kailash is a fairly weird establishment in its own right...it's a big building, that you can see from the other side of the street, but the door which opens out into the marketplace is so small and narrow that you you can walk by it three or four times without noticing it. It's easier to tell where the hotel is from 100 meters away than when you're right in front of it. But the staff there was nice. They let me use their kitchen, and one of the guys was most fascinated by my Chinese made Mussoorie switch blade. He wanted me to give it to him as a tip, but I was cutting a watermelon at the time, and I had to politely inform him that "Tarbooze Key liye, yeh churi Zoori hai" or "this knife is vital for watermelons." 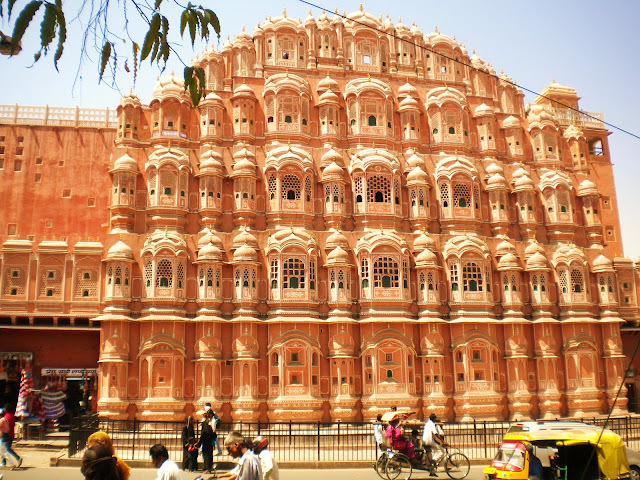 Exterior of the Hawa Mahal, or Palace of the Winds. Jaipur itself is a decidedly mixed bag. 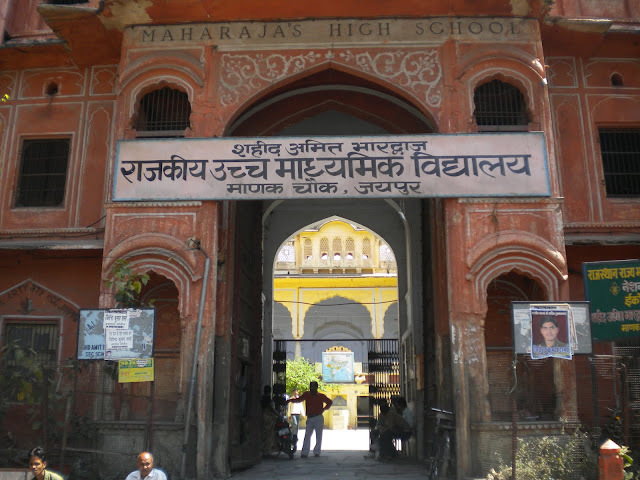 It really is full of amazing architecture and history, and it's unusual in that it was, at the time of it's establishment, the only planned city in India. Also, it wasn't always pink. It was painted that color prior to a visit from the Prince of Wales in the 1870s, and I guess the locals liked it, because it's remained that color ever since. 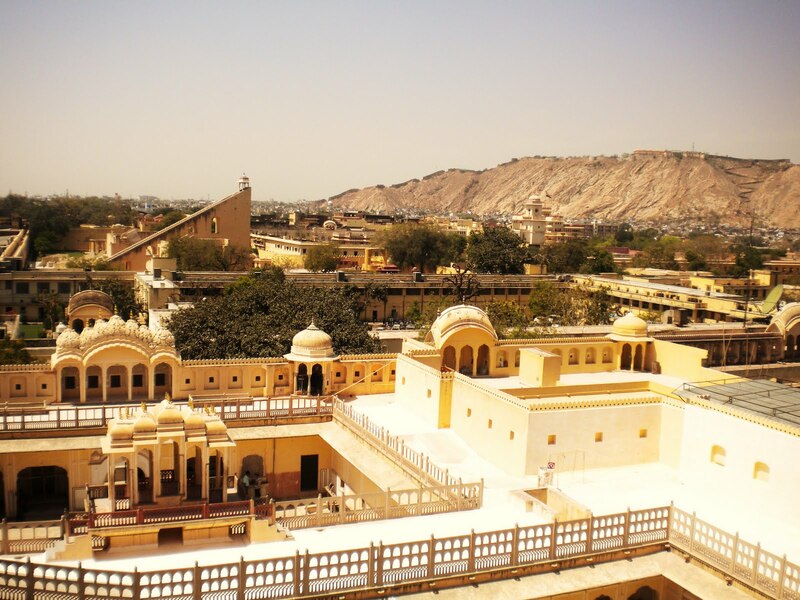 Jaipur is also a fairly easy city to navigate, and if, like me, you're ensconced in Hotel Kailash, all of the things you would really want to see inside the city itself are within walking distance. So, Jaipur's most famous landmark, the Hawa Mahal, was literally five minutes from my hotel (though the death defying trip across Jaipur's lethal streets makes it seem somewhat longer). It's an impressive structure, though it's also maybe the weirdest piece of architecture I've ever clapped eyes on. 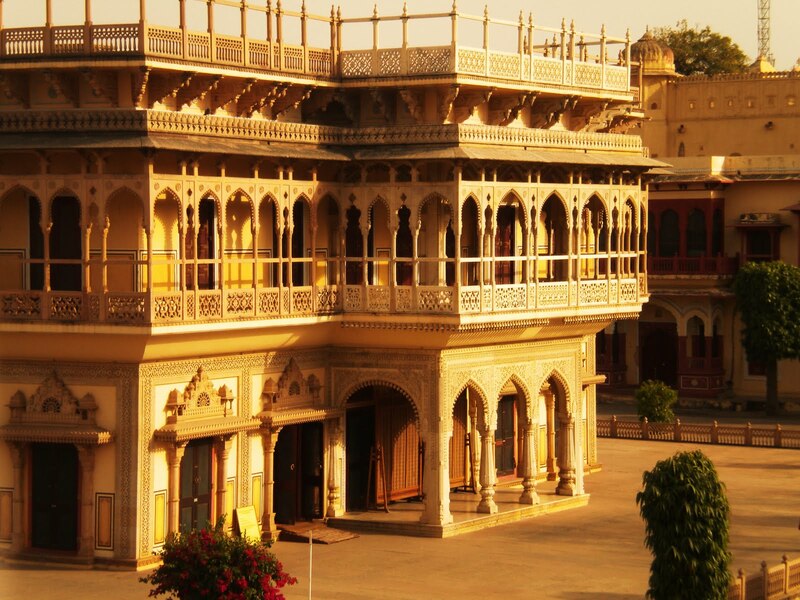 It was built in 1799 to allow the royal ladies of Jaipur to be able to observe life on the streets below. The street facing portion of the street was meant to resemble Krishna's crown. And it does, sort of. But what's so strange about the building is that the structure facing the street is little more than a screen composed of nearly a thousand little compartments. 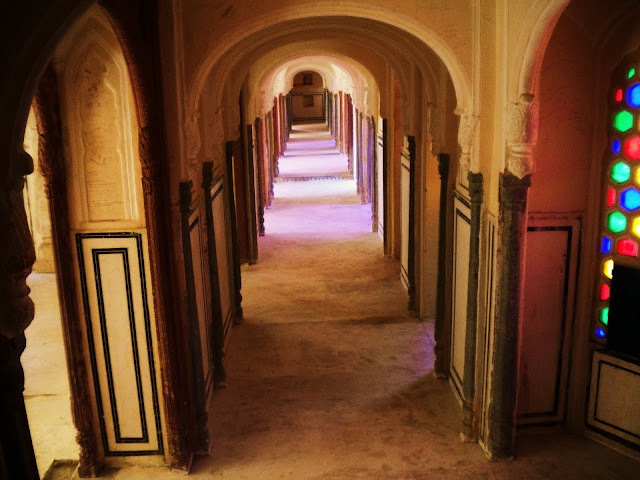 The other side of the Hawa Mahal. View across Jaipur from the Hawa Mahal. 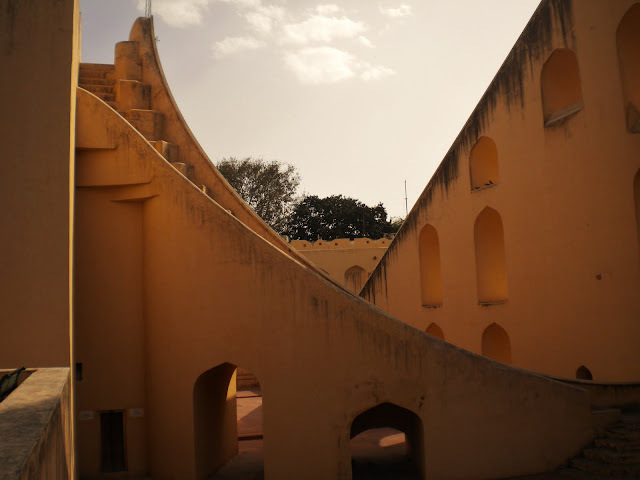 The angular structure to the left is the Samrat Yantra of the Jaipur Jantar Mantar, which I visited on a latter date. 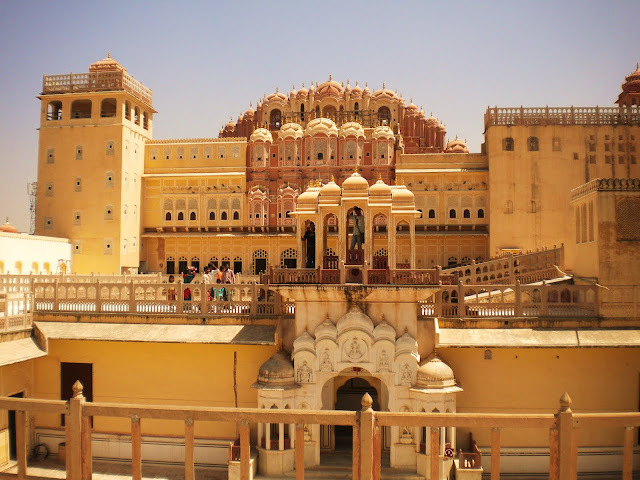 In the middle is the Jaipur City palace. On the hill in the background is Nahargarh Fort, sometimes referred to as Tiger Fort. 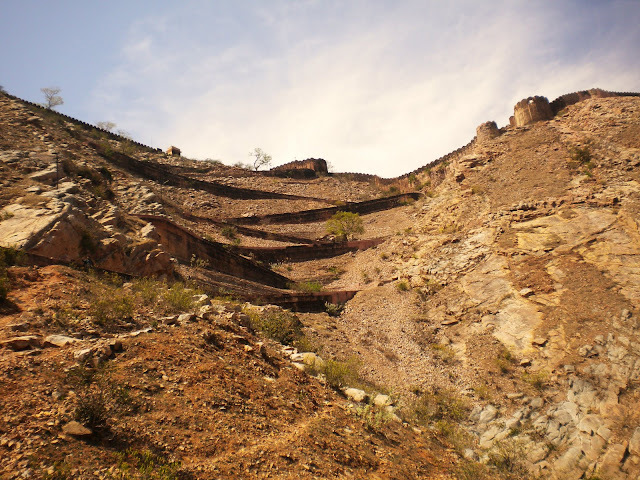 The road up to Nahargarh Fort. 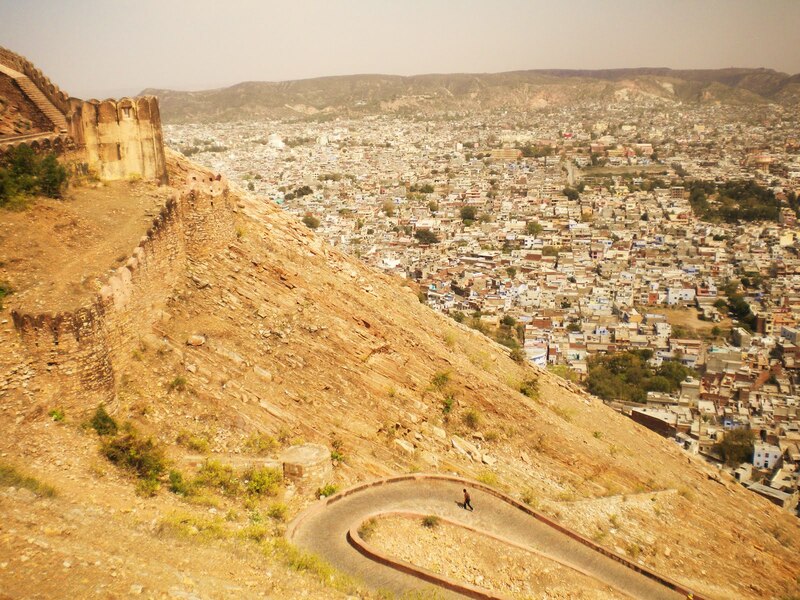 After the Jantar Mantar, I made my way up to Nahargarh Fort, which is perched on a ridge about 800 ft above the city. 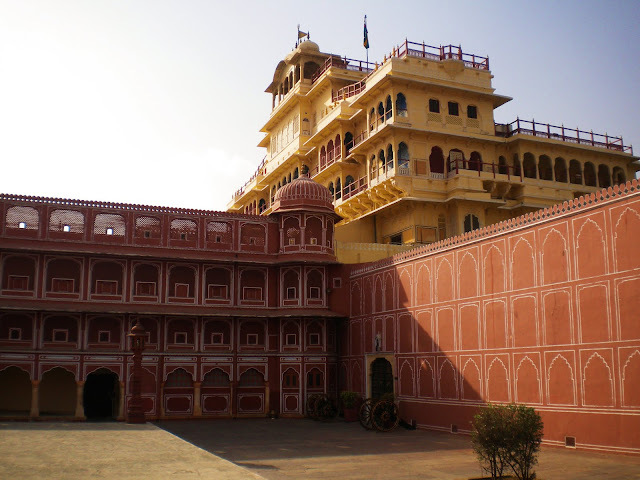 When Maharaja Jai Sing II first moved his capitol from Amber to newly constructed Jaipur, this is where he lived. 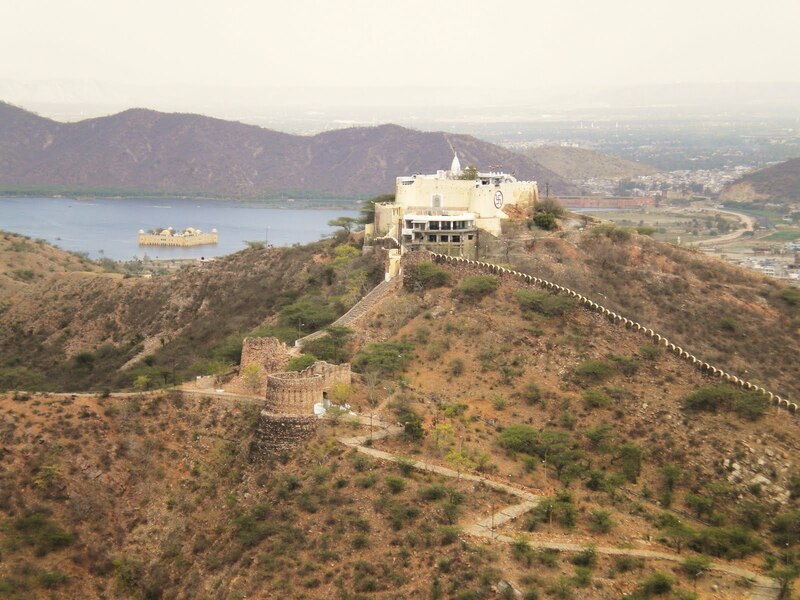 As Rajasthani Forts go, it's not as impressive or as beautiful as Amber Fort or Jaisalmer Fort, but the views out over Jaipur are extremely impressive, and the trek up the foot path from the city below is an interesting walk. 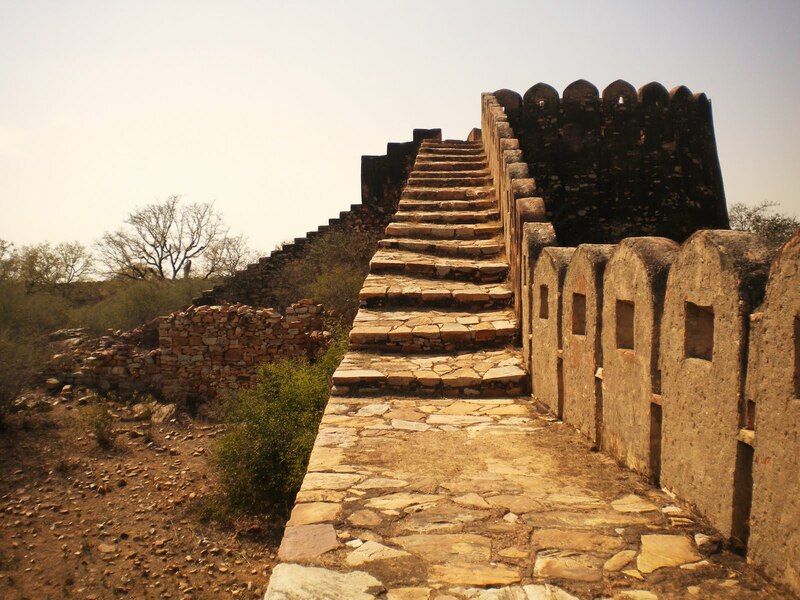 Also, the battlements have a very functional feel to them...one time, while I was on the walls, a group of Indian guys decided that they would depart from the path and try and get to the fort by heading straight up the hill. Much was their disappointed when they found that the summit was protected by a 15ft defensive wall. Ultimately, they had to retreat. I'm sure the original builders of the fort would be proud to know that, three hundred years on, their fort was still turning back hordes of invaders. View from the road up to the fort. View east from the battlements. The palace in the lake in the background is the Jal Mahal. The temple in the center of the photograph is the Garh Ganesh Mandir. You can also see what appears to be a subsidiary fort, and more of the battlements, which run along along the tops of the hills and extend all the way Amber Fort, 11 kilometers away. 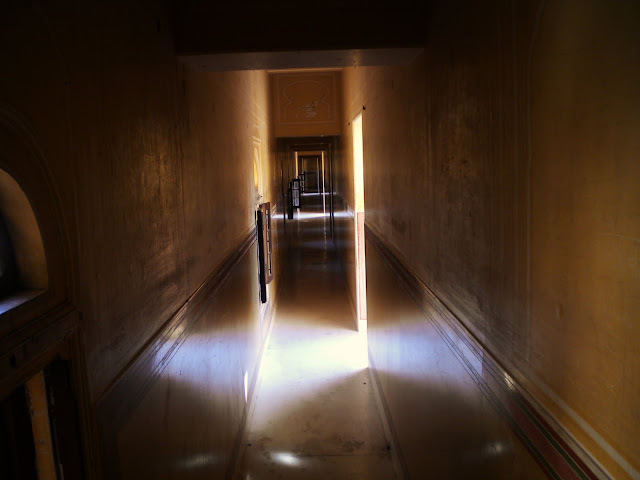 Corridor in the palace complex inside Nahargarh Fort. 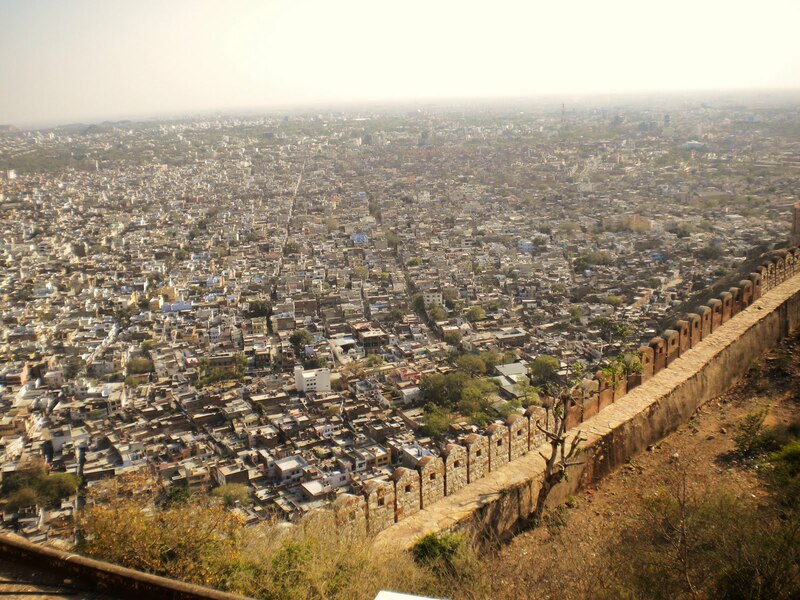 View out over Jaipur. Notice the rational street layout; unusual for an Indian city. In the palace, late in the day. 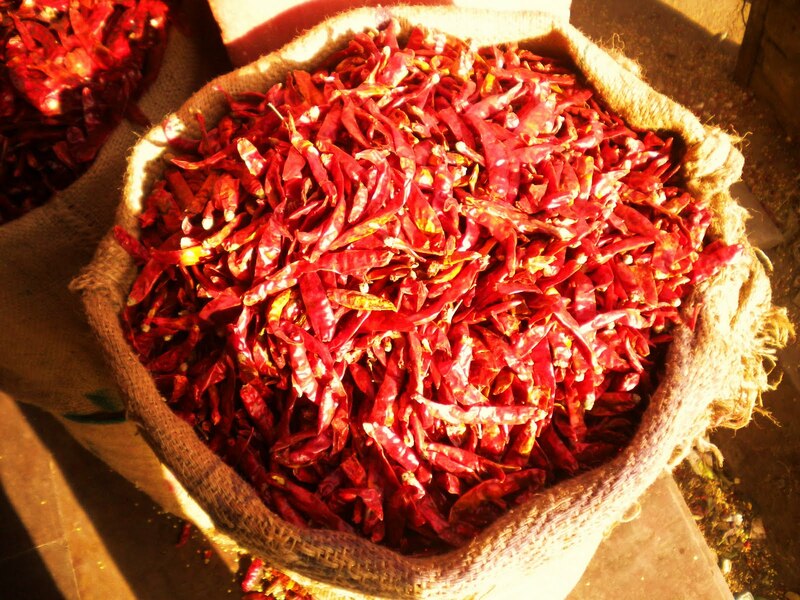 Too many chilies. I broke into a sweat just passing by this. The next day I visited the Jaipur Jantar Mantar and the City Palace. Maharaja Jai Sing II built five Jantar Mantars (including the one in Delhi, next to the YWCA). 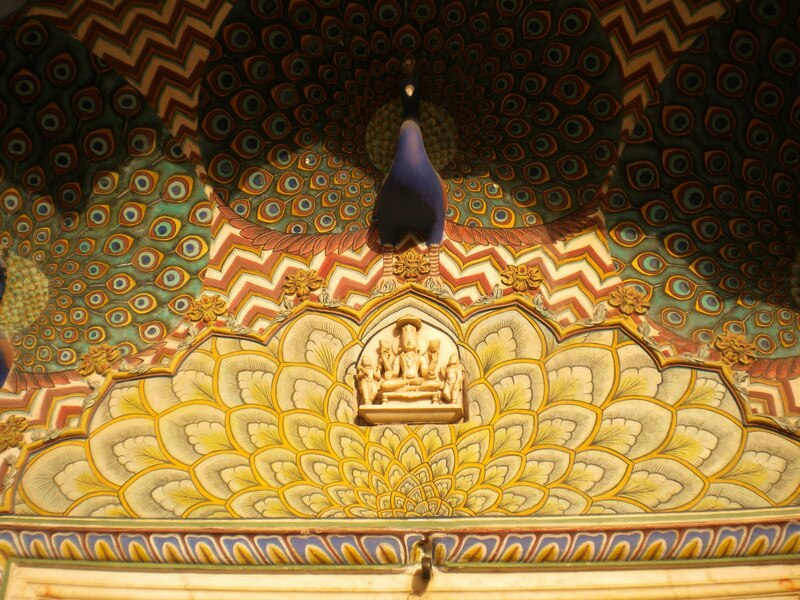 However, the one in Jaipur is supposed to be the best preserved...and speaking of weird. 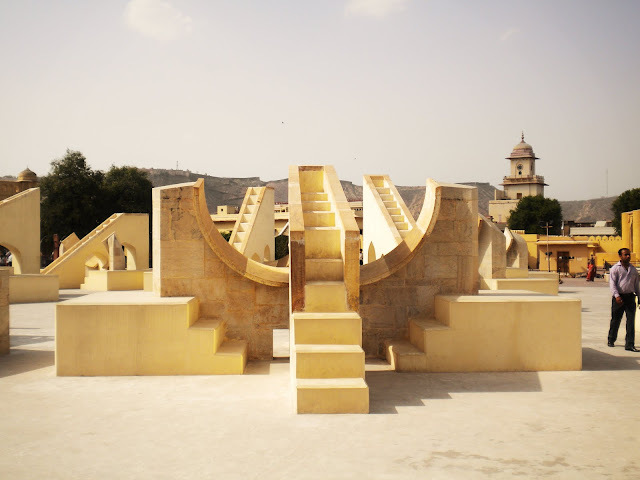 The structures in the various Jantar Mantars, which look at first glance like giant senseless pieces of modern art, are actually astronomical instruments. The Jai Prakash Yatra. It was used for observing the motions of the sun, the constellations of the Zodiac, and for calibrating the other instruments in the observatory. It also appears briefly in the film "The Fall." 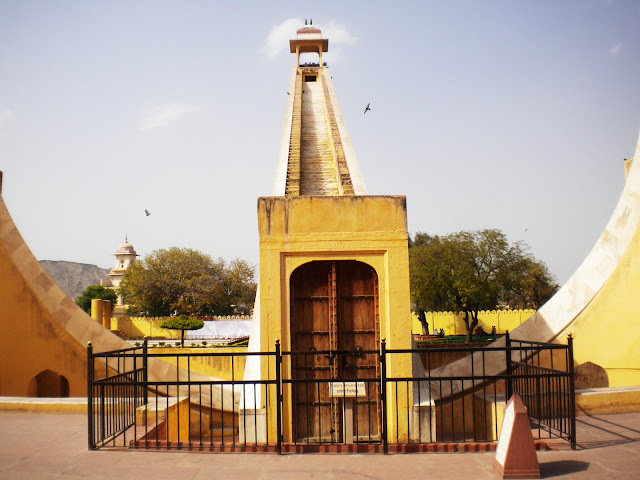 The Samrat Yantra. Its name means "Great Instrument." 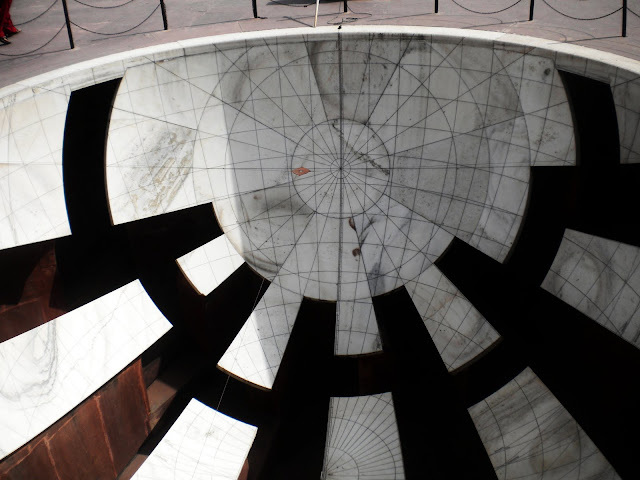 It is the largest sun dial in the world, and it also features briefly in "The Fall." Someone, I forget who, goes running up those stairs. I also took a brief visit to the Jaipur City Palace. I had been there before, back in 2009, but as I remembered the trip was rather rushed. This time I decided I would do something I had never done before....I took the audio tour, where a rich fruity voice explains to you the various things to see...actually, if you want to follow the audio tour, you have to take a sort of set path, but I always wind up going here and there and not really going in any sort of order. But still, you can learn some interesting facts...and the guy's voice sure was rich and fruity. 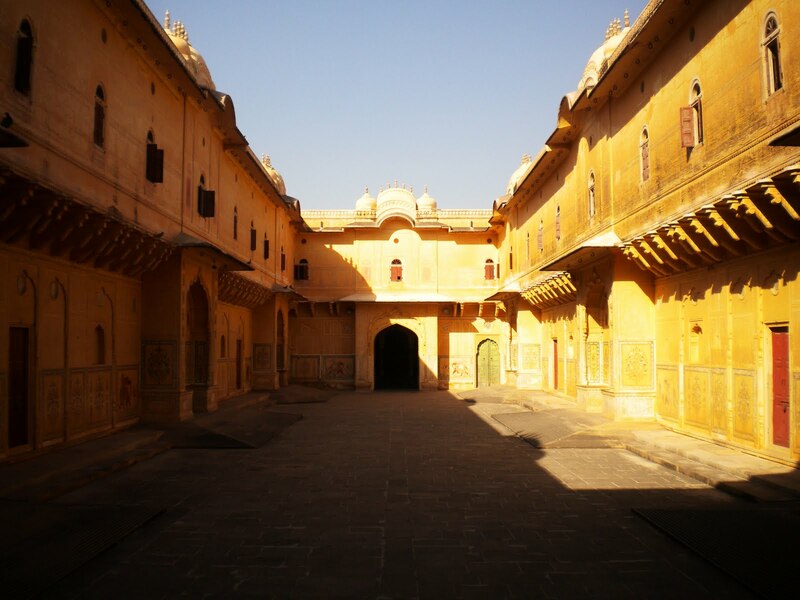 Courtyard inside the Jaipur City Palace. The large building in the background is the Chandra Mahal, which is still occupied by the Jaipur royal family. The city palace was also begun under Jai Sing II, though I don't believe he actually lived there. The design of the place employs that usual combination of Islamic, Hindu, and Western architecture than one often encounters in Rajasthan. While the exteriors show and obvious Mughul influence, many of the interiors, such as the Diwan-i-am or Hall of Public Audience, are decidedly European in in appearance, even if some of the architectural load bearing members (i.e. the arches) retain an Islamic appearance. 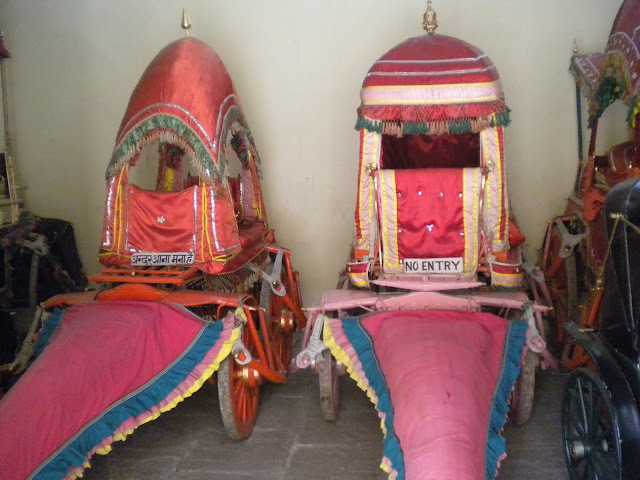 Horse drawn carriages for Hindu religious processions. My personal favorite place in the palace was the arms exhibit. It's the kind of place where, when you walk in, you see the word "Hello" spelled out in weapons, an assortment of guns and knifes forming the individual letters, and when you leave, you see "Goodbye" written in the same fashion. It's charming, in a "this is completely nuts" sort of a way. (unfortunately, you can't take pictures). Inside there's a gigantic array of armaments, including a vast selection both of knives that open like scissors after they've been plunged into an enemy's body, and weapons that are a combination of guns and knives. For example, you might have a sword with two flintlocks attached to the hilt. Kya Maza Hai! Door representing summer in the Pritam Niwas Chowk. 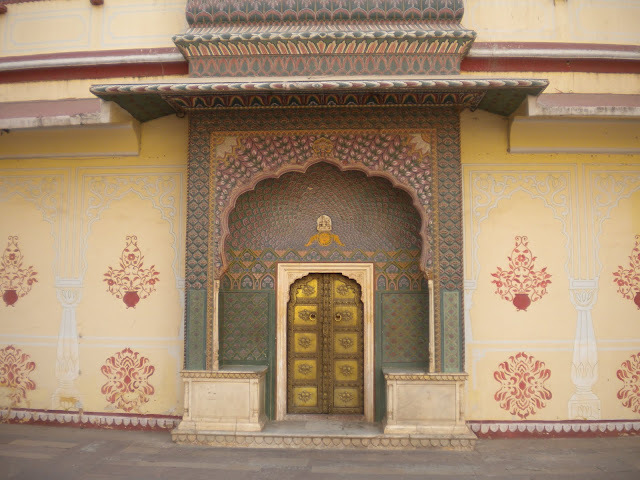 Perhaps the most amazing things to see in the palace are the four Doors of the Pritam Niwas Chowk (where the door at the top of the post is located). The courtyard is apparently a favorite location for Bollywood shoots. The Mubarak Mahal, built by Maharaja Madho Singh II (who's chief claim to fame is being fat and horny) in the late 19th century. Sunset over Rajasthan from Tiger Fort. The fort was a great place to climb up and see the sun go down. I was forced to write this post over the space of a couple of days. I fear the second half won't be coming for a while yet. I am actually in Uttarkashi now, and am going to attend the Nehru Institute of Mountaineering tomorrow for a one month basic course. Wish me luck! And pray I don't fall off the mountain!